Built 1744-1748 by Antonio Galli-Bibiena after plans by Jean Nicolas Jadot de Ville-Issy for Empress Maria Theresia, converting the previous theatre to two concert and ball halls, "Großer Redoutensaal" and "Kleiner Redoutensaal". 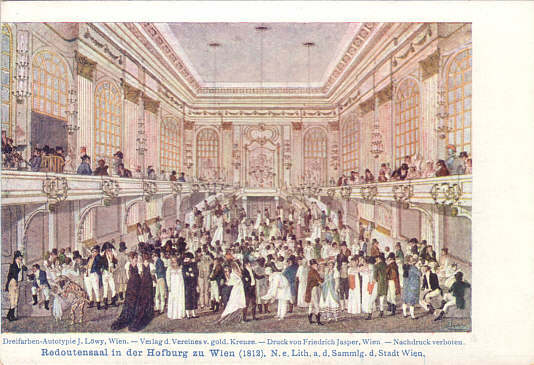 Opened 1748 with a masked ball. 1749 installation of a connecting walkway between the halls and the imperial apartments. 1759-1760 rebuilding by Nikolaus Pacassi. Used for balls, concerts, and other court festivities. 1769-1772 façade alteration by Nikolaus Pacassi. 1773-1776 extension by the "Durchfahrtshalle" towards the Stallburg. 1788 installation of a gallery tier. 1816, 1840, 1892-1893 alterations by Ferdinand Kirschner. 1921 installation of a theatre ("Theater im Redoutensaal"). 1973 conversion to a congress centre. Site of the SALT II treaty signing on 18 June 1979. "Großer Redoutensaal" completely destroyed, "Kleiner Redoutensaal" severely damaged by a fire on 26/27 Nov 1992. 1992-1997 rebuilt to the original plans by Manfred Wehdorn. Currently used for concerts and congresses. Großer Redoutensaal: up to 680 seats, Kleiner Redoutensaal: up to 260 seats. Reverse Text: "Meytens-Schule um 1762/63 - Theateraufführung anläßlich der Vermählung Jospehs II. 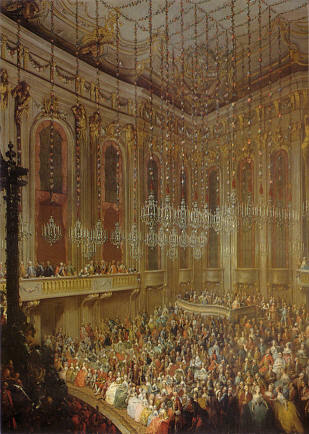 mit Isabella von Parma, 1760 - A Theatre Performance on the occasion of the Marriage of Joseph II to Isabella of Parma in 1760"